Wildlife from birds to bats will have new hedgerows to call home after more than 1,600 hedge plants were planted on our nature reserve. The new hedgerows filled with shrubs and trees perfect for a wide variety of Carymoor creatures were funded by a grant from the D’Oyly Carte Charitable Trust. Carymoor’s dedicated team of volunteers and students from Farleigh College in Frome helped our conservation team get the hedge plants in the ground last week. With a reduction in the amount of woodlands in the UK, hedgerows have taken on more importance, providing a vital habitat for a range of priority species. They are breeding sites for birds, small mammals and invertebrates and provide an important food source. 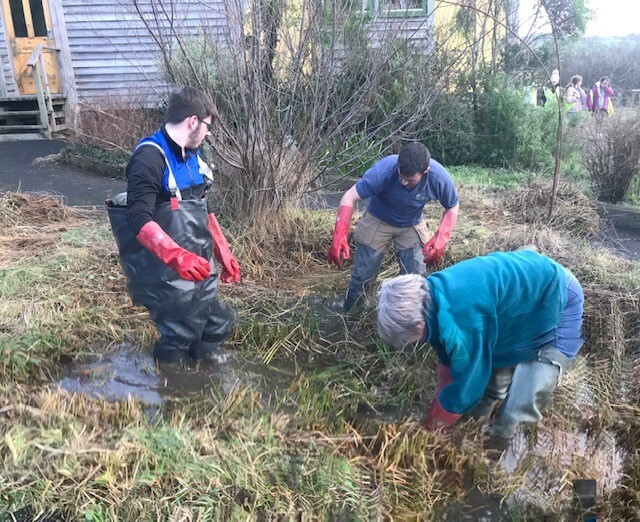 Elsewhere on our nature reserve, students from Newbury Manor School in Mells have been busy clearing out the nature pond next to our Education Centre. The pond needs a good clean up every winter to remove weeds and rushes that overcrowd the water and shade out other plants.